The United Nations condemned an attack that killed a Rwandan peacekeeper and wounded eight others in the Central African Republic on Tuesday. The death was the result of an exchange of gunfire between UN. peacekeepers and armed militants shortly after the United Nations Multidimensional Integrated Stabilization Mission launched an operation in the country, a spokesman for UN Secretary-General António Guterres said in a statement. "The Secretary-General offers his deepest condolences to the family of the bereaved, as well as to the Government of Rwanda, and wishes a swift recovery to the injured," the spokesman said. "The Secretary-General recalls that attacks against United Nations peacekeepers may constitute a war crime and calls on the Central African Republic authorities to investigate them and swiftly bring those responsible to justice." Lt Col. Innocent Munyengango, Rwanda's Military and Defense spokesperson, told Rwandan news site The New Times that several Rwandan peacekeepers with the United Nations were called in to help stop a militant attack. 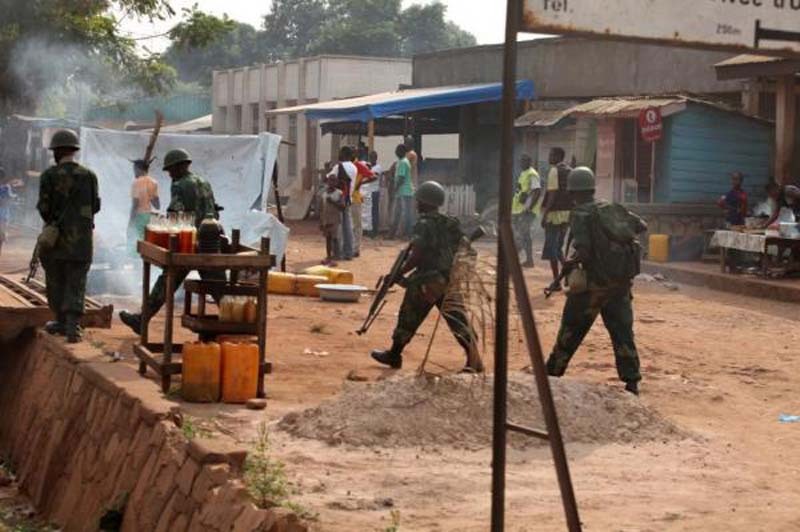 "They had been deployed to rescue civilians who had been attacked by the armed elements in a place called PK5 -- a city suburb in Bangui," Munyengango said. "Our forces managed to stop the fight and rescued civilians but unfortunately one of our soldiers lost his life and eight were injured." He added that the injured peacekeepers are "recovering well."